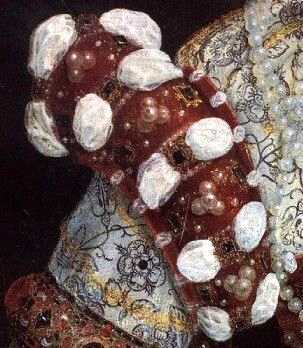 I also started to think about how these sleeves in the Pelican Portrait could work. What will be called a shoulder roll (A) for clarification from now on, is basically off the shoulder and doesn’t seem to have any contact with the bodice at all except perhaps under the arm, but that can’t be safely said. Perhaps this is some kind of freedom the artist took, or there’s also the possibility that the painter had to paint the gown when it was laid out for him instead of having someone wear it, which was common practice. I figured out that this wouldn’t work, unless I would pin the sleeve to the partlet or so – which was something I didn’t want. The shoulder rolls are decorated with strips and slashed piping (B). However, the pattern I used only offered shoulder rolls – attached to the outside of the shoulder bands – or attached, short puffed sleeves decorated with bands, which didn’t look much like what I wanted, meaning: What was to be seen in the portrait. So I decided to invent new sleeves for the pattern – I will get back to that subject later on this page. 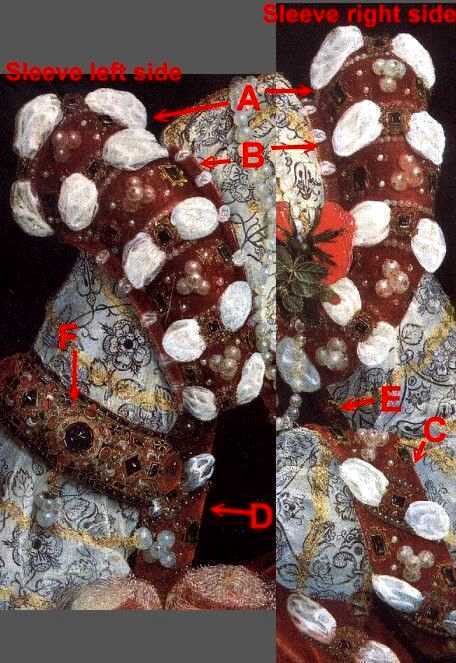 On the left side of the picture, between her arm and the bodice (D), you can see something that looks remotely like a hanging or Spanish sleeve, but it’s only on the underside of the arm and not at the top nor the front – something likely can be seen on the other side (E), but much more narrow, under her arm, resulting in that strange band which then winds around the lower arm and continues on the overskirt (this can better be seen in the full portrait instead of the collage above). After I had *long* thought about how to make something like this (cutting away the upper/front portion of a Spanish sleeve, for example…), in the end I had to omit those parts of the mystery sleeves because I ran out of velvet (wasn’t that somehow clear after knowing that I only had five yards…?). Perhaps I will take that task one day, when I accidentally stumble over a piece of closely matching velvet – but for the moment, it’s off the table. I will then construct some kind of “Spanish sleeves without fronts, the lower sleeve forming a heavily decorated band”, I guess, which I then can lace to the shoulder rolls. 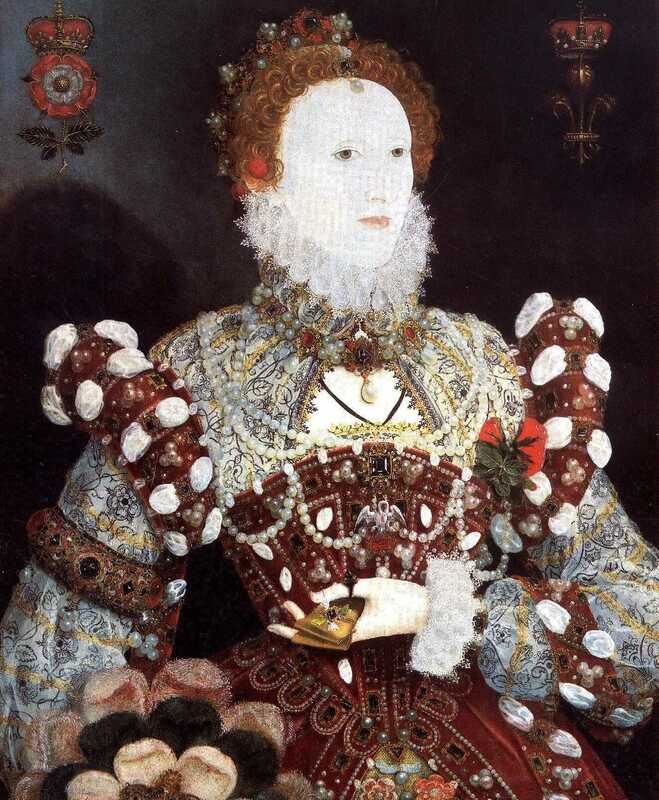 (F) by the way is, according to Janet Arnold’s “Queen Elizabeth’s Wardrobe unlock’d”, not part of the gown, but a jewel around the upper arm which Janet Arnold calls an “Armlet”. I will for my own sanity believe just that and get back to it in the “Sleeveband” chapter of this diary. Now for a moment back to those strange, rolled sleeves and my solution for them. After trying a mockup of shoulder rolls next to the sleeveband (which didn’t work the way I wanted to) and also making actual “paned cap sleeves” from Margo’s pattern (which didn’t give me the right look either…), I knew I had to invent some new sleeves for the bodice without using Margo’s pattern. I neither liked nor trusted the “we have absolutely no contact with the bodice except perhaps under the arm”-sleeves from the portrait; they made me feel as if they would slip down the arm any minute. 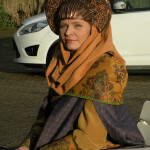 Then I decorated that “pouf-roll” with the straps of velvet I already had from constructing the paned cap sleeves. The back of the gown was a bit difficult as the shoulder strap is a part of the back piece there; here I just let the pouf disappear under a very short decorated strip. This is how it looked when pinned (the right picture side has the pinned roll – compare to the left side which has the paned cap sleeve pinned to it, which in my opinion looks nice, but doesn’t work on this gown): The roll doesn’t yet properly “stand”, because it’s just pinned and therefore not properly stuffed, plus the seam allowances are still facing towards the outside, not to the inside. The front is not properly closed, therefore the white linen lining is showing at the front opening. So I basically flattened the front of the roll a little, lengthened the white inlet to the back and added two more decorated strips, pulling it down further to make it look more balanced from the side. The pulled down back, for which I had to remove one of the golden disks on each side, closed with the pearl decorations on the back, making it look as if the sleeve was intended to be this way. Here’s the picture of that ‘new’ version of the shoulder rolls, in the first picture still pinned and not sewn plus the new additional strips are still missing – but decide for yourselves if they look better and more balanced now. Yes, I know – the white puffs don’t come out as much on my roll – but a) that’s something I can live with, and b) I could – if I wanted to – still add a bigger piece of fabric under the straps to achieve exactly this effect… 😉 Other than that, I think my shoulder rolls look really good compared to the original rolls. And now, ladies and gentlemen – let’s go for the overskirt.